So, when you’ve had a career in rowing that’s taken you as far as representing your country at World under-23 level, but you know deep down that’s as far it’s going to be…how do you get to realize your lifelong ambition of competing at the Olympic Games? In 29-year-old Emily Dreissigacker’s case, you turn to biathlon and race at the 2018 Olympic Winter Games in PyeongChang, South Korea… that’s how. Having rowed at Dartmouth, and also as a member of the Craftsbury Green Racing Project, Emily’s rowing career reached its height at under-23 level where she raced in the USA women’s quads at Racice in the Czech Republic in 2009 and in Brest, Belarus in 2010. But after this, Emily reached a decision -“Going to the Olympics has always been a goal for as long as I can remember. 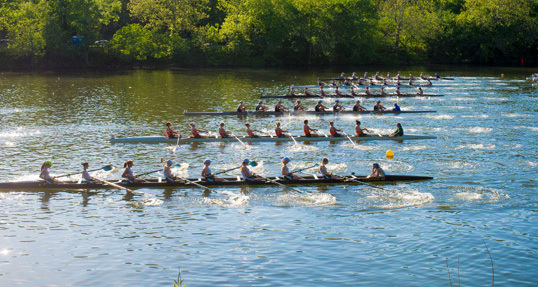 But I think I had finally gotten to the point with rowing where I was thinking ‘ oh – that’s not going to happen’. I was ok with that and made my peace with that realization’. Emily is a member of one of the most famous families in modern-day rowing, so it is no surprise that she learned to row, along with her brother and sister, almost as soon as she could walk. But, living and growing up in Craftsbury, Vermont, skiing was also a favorite family pastime. With skiing in the family background, and with the Craftsbury Green Project embracing rowing, Nordic skiing, and biathlon, the switch-over was not difficult to predict. It was Emily’s brother who introduced her to biathlon but it wasn’t necessarily love at first sight. After this, a domestic accident would play a key role in bringing her back to biathlon. For all that they differ in many ways, there are characteristics that these two sports share. First, as rowers know all too well if you want to become rich through sport… pick another one. And about biathlon, Emily confirms, “I am a biathlete, but that’s not a way to make a living’, and, on this, she speaks for her husband too – Alex Howe, who is also a biathlete. This is Emily’s first year on the national team and before that, as a member of the ‘B’ squad, the only support she got was health and insurance coverage. She is also clear about the differences between the sports too. “Selection in biathlon is less physically brutal than in rowing, but it’s pretty mentally tough. The sport is very mental. The shooting aspect is so easy to mess yourself up by thinking the wrong thing and getting ahead of yourself. Shooting is just an incredibly mental thing. Try as they no doubt did, the US biathlon team performance at PyeongChang did not get them near the podium. Emily raced in four different events and anchored the women’s relay squad to a creditable 13th finishing slot.